Film Plot: A small group of French students are studying Mao, trying to find out their position in the world and how to change the world to a Maoistic community using terrorism. Grade: C6	Fine. Folded, single-sided. Prior to linen backing the poster was in nice condition with minor edge/handling wear and several small tears extending 1-2" into the image. Expert restoration has addressed these flaws and the poster now appears very fine. In 1967 Jean Luc-Godard made La Chinoise, a black comedy and loose adaptation of Fyodor Dostoyevsky’s 1872 novel, The Possessed. In the book, five disaffected citizens, each representing a different ideological persuasion and personality type, conspire to overthrow the Russian imperial regime through a campaign of sustained revolutionary violence. Godard’s film updated the setting to modern day France and group of revolutionary youths. Given that less than 6 months after this film was released violent student protests became the new social reality in France — La Chinoise is now regarded an insightful and prescient examination of radicalism in the 1960s. 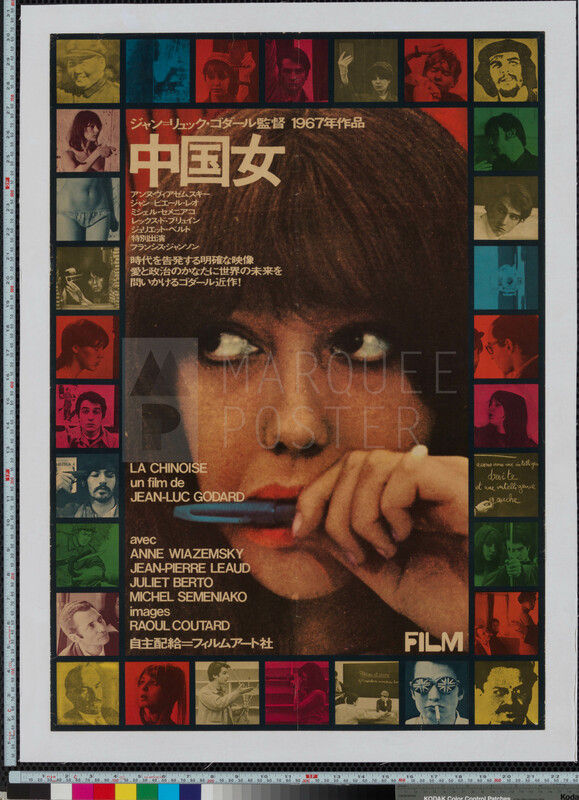 While most of the promotional materials wisely focused on Juliet Berto captivating eyes, this colorful Japanese poster added a wonderful series of portraits along the border to highlight the many characters and persons present throughout the film. This rare Japanese design is easily one of the most desirable posters from the film.